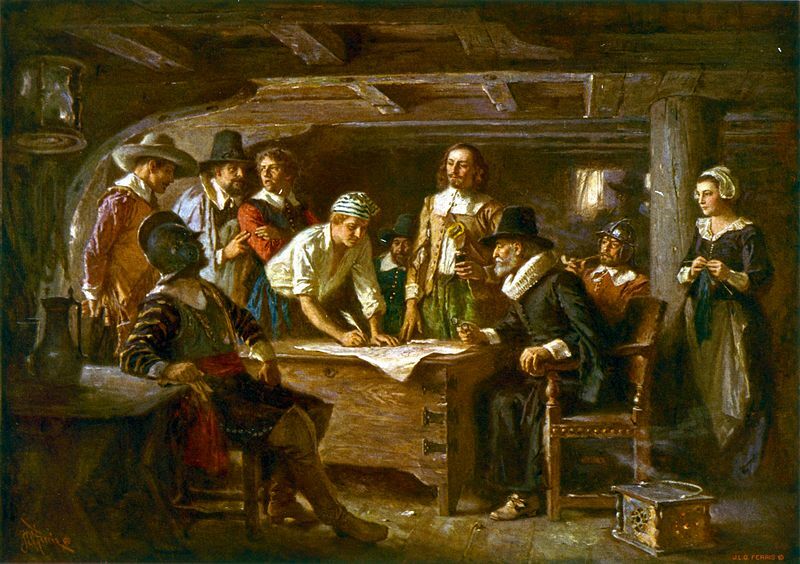 Passengers of the Mayflower (Carver, Winston, Alden, Myles Standish, Howland, Bradford, Allerton, and Edward Fuller) sign the 1620 Mayflower Compact in this 1899 J. L. G. Ferris painting. Edward Fuller was an ancestor of several 47th Pennsylvania Volunteers (image: public domain). The members of the Fuller family of Catasauqua, Pennsylvania who served with the Union Army during the Civil War hold a distinguished place in American history. Each of the Fuller men who served with the 47th Pennsylvania Volunteers was descended from England’s Robert Fuller, the father of Edward Fuller, 21st signatory of the Mayflower Compact. Edward Fuller later arrived aboard the Mayflower with his wife, Anne, and sons, Matthew and Samuel, at Plymouth Rock, Massachusetts in November 1620. Fifteen years later Samuel was married to Jane Lathrop by Captain Miles Standish in Scituate, Massachusetts on 8 April 1635. Samuel Fuller then ultimately became the great-great-great-grandfather of two members of the 47th Pennsylvania Volunteers – 1st Lieutenant George W. Fuller and Private Orlando Fuller of F Company – and the great-great-great-great-grandfather of another – 1st Lieutenant and Regimental Adjutant James W. Fuller, Jr. who served as a sergeant with F Company before being promoted to the same regiment’s central command staff. In 1860, Orlando and George Fuller resided in Catasauqua, Lehigh County, Pennsylvania with their parents, Pennsylvania natives Chauncey Day Fuller (1799-1870) and Sarah (Abbott) Fuller (also born sometime around 1799). There, their father was employed as a Justice of the Peace while George and Orlando helped out financially through employment, respectively, as a laborer and clerk. Meanwhile, James W. Fuller, Jr. was also residing in Catasauqua with his parents, Clarissa (Miller) Fuller, a Pennsylvania native and daughter of Henry and Catherine (Sterner) Miller, and James Wheeler Fuller, Sr. (1821-1872), a native of Forty Fort, Northampton County, Pennsylvania who was another son of Chauncey Day Fuller and brother to the aforementioned Orlando and George Fuller. Described on the 1860 federal census as a “Gentleman,” James W. Fuller, Sr. was a close friend of Andrew Gregg Curtin, 15th Governor of the Commonwealth of Pennsylvania. During the worst days of the Rebellion, when Curtin needed help, no man did more to assist him in sending soldiers to the front [than James W. Wheeler, Sr.]. Often, to get relief from the cares of office, Governor Curtin came to Catasauqua to spend Sunday at the Fuller home. James W. Fuller, the first, was one of the most active spirits in raising the 47th Regiment, Pennsylvania Volunteers, of which his son, James W. Fuller, second … became adjutant. George W. Fuller was born in Northampton County, Pennsylvania on 1 September 1839. He was a son of Sarah (Abbott) Fuller and Chauncey D. Fuller, a brother of James W. Fuller, Sr. and fellow 47th Pennsylvania Volunteer Private Orlando Fuller, and an uncle of 1st Lieutenant and Regimental Adjutant James W. Fuller, Jr., also of the 47th Pennsylvania Volunteers. According to Wint, George W. Fuller’s father had come “to the Lehigh Valley area from the ‘Plains’ above Wilkes-Barre soon after construction on the Lehigh Canal commenced,” worked for the Lehigh Coal and Navigation Company, and then later relocated to Catasauqua with his wife and children (including George Fuller). There, in Catasauqua, Chauncey Fuller’s eldest son, James Wheeler Fuller, Sr. (1821-1872), was “a large scale horse dealer with the federal government,” during the early years of the Civil War. George W. Fuller enrolled for military service at Catasauqua at the age of 21 on 21 August 1861, and mustered in on 30 August 1861 at Camp Curtin in Harrisburg, Dauphin County, where he was elected by his fellow Company F members to serve as a 1st Lieutenant under Captain Henry S. Harte. His brother, Orlando Fuller, also enrolled and mustered in at the same time with Company F of the 47th Pennsylvania, as did their nephew, James W. Fuller, Jr. Orlando became a 36-year-old Private while James, Jr. became a Sergeant. Although military records initially indicated that James was 18, he may in fact have been only a 16-year-old boy. While at Camp Kalorama, the men of F Company also experienced the first of the many directives (Company Order No. 1) to be issued by Captain Harte – that F Company drill four times per day, each time for one hour. 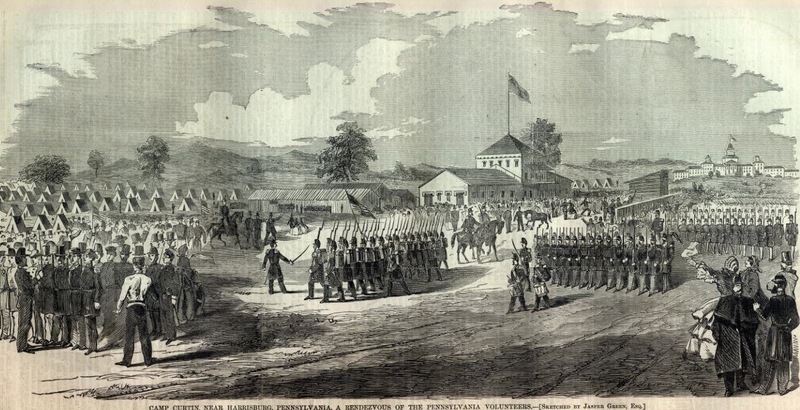 On 24 September, the 47th Regiment, Pennsylvania Volunteer Infantry became part of the U.S. Army as its men were officially mustered into federal service. On 27 September, the 47th Pennsylvania was assigned to Brigadier-General Isaac Stevens’ 3rd Brigade, which also included the 33rd, 49th and 79th New York regiments. That afternoon, the 47th Pennsylvania was on the move again as its Mississippi rifle-armed infantrymen marched behind their regimental band until reaching Camp Lyon, Maryland on the Potomac River’s eastern shore. At 5 p.m., they joined the 46th Pennsylvania in moving double-quick (165 steps per minute using 33-inch steps) across the “Chain Bridge” marked on federal maps. Marching toward Falls Church, Virginia, they arrived at Camp Advance around dusk. There, after completing a roughly eight-mile trek, they pitched their tents in a deep ravine near Fort Ethan Allen and General W. F. Smith’s headquarters. Now part of the massive Army of the Potomac, they would help to defend the nation’s capital from the time of their September arrival through late January 1862. On 1 October 1861, Sergeant James W. Fuller, Jr., the nephew of 1st Lieutenant George W. Fuller and Private Orlando Fuller, was promoted from his service with F Company to the rank of 1st Lieutenant and Regimental Adjutant with the regiment’s central command staff, a position he held for just over three months. As a reward for their performance that day – and in preparation for the even bigger adventures which were yet to come, Brigadier-General Brannan ordered that brand new Springfield rifles be obtained for every member of the 47th Pennsylvania Volunteers. By the afternoon of Monday, 27 January 1862, the 47th Pennsylvania Volunteers had commenced boarding the Oriental. Ferried to the big steamship by smaller steamers, the enlisted men boarded first and the officers boarded last. Then, per the directive of Brigadier-General Brannan, the Oriental steamed away for the Deep South at 4 p.m. 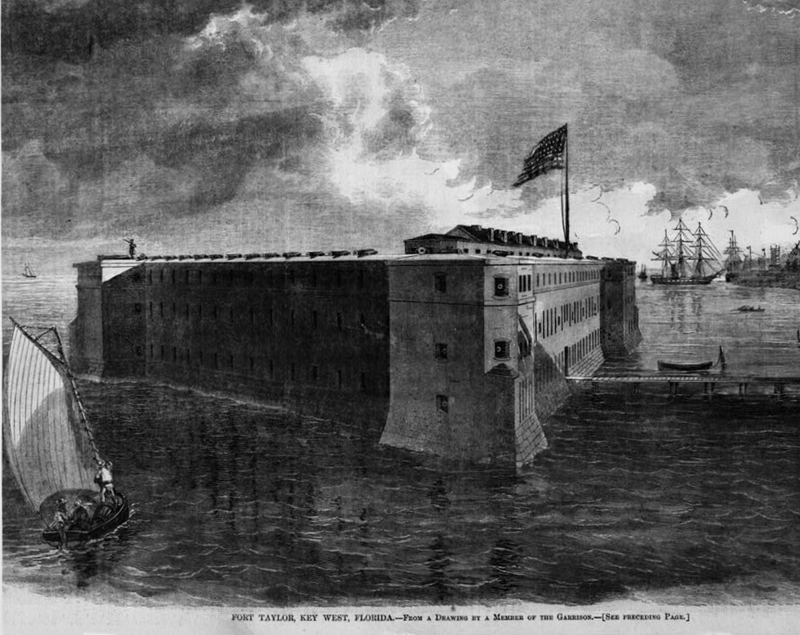 The 47th Pennsylvanians were headed for Florida which, despite its secession from the Union, remained strategically important to the Union due to the presence of Forts Taylor and Jefferson in Key West and the Dry Tortugas. In early February 1862, the remaining Fullers (George and his older brother Orlando) arrived in Key West with their fellow 47th Pennsylvanians, and were assigned to garrison Fort Taylor. On 14 February, the regiment made its presence known to the local residents via a parade through the city’s streets. Men from the regiment also mingled with the locals during church services in town that weekend. Drilling daily in heavy artillery tactics, the regiment also strengthened the fortifications at the federal installation. The climate, initially a welcome change from the wintry north, turned out to be harsher than the men could have imagined; several members of the 47th fell ill, largely due to poor sanitary conditions and water quality. From 21-23 October, under the brigade and regimental commands of Colonel T. H. Good and Lieutenant Colonel George W. Alexander, the 47th engaged the heavily protected Confederate forces in and around Pocotaligo, South Carolina – including at Frampton’s Plantation and the Pocotaligo Bridge – a key piece of southern railroad infrastructure which Union leaders felt should be destroyed. Harried by snipers en route to the Pocotaligo Bridge, they met resistance from an entrenched, heavily fortified Confederate battery which opened fire on the Union troops as they entered an open cotton field. Those headed toward higher ground at the Frampton Plantation fared no better as they faced artillery and infantry fire from the surrounding forests. The Union soldiers grappled with Confederates where they found them, pursuing the Rebels for four miles as they retreated to the bridge. There, the 47th relieved the 7th Connecticut. But the enemy was just too well armed. After two hours of intense fighting in an attempt to take the ravine and bridge, depleted ammunition forced the 47th to withdraw to Mackay’s Point. Losses for the 47th Pennsylvania were significant. Captain Charles Mickley of G Company was killed in action. Captain George Junker of Company K was mortally wounded, as was Private John O’Brien of Company F. On 23 October, the 47th Pennsylvania returned to Hilton Head, where it served as the funeral Honor Guard for General Ormsby McKnight Mitchel, the commander of the U.S. Army’s 10th Corps and Department of the South who had succumbed to yellow fever on 30 October. The Mountains of Mitchel, a part of Mars’ South Pole discovered by Mitchel in 1846 while working as a University of Cincinnati astronomer, and Mitchelville, the first Freedmen’s town created after the Civil War, were both later named for him. Men from the 47th Pennsylvania were given the high honor of firing the salute over his grave. As with their previous assignments, the men discovered that disease would be their constant companion and foe. A number of men from the 47th Pennsylvania fell ill; still more died. Casualties were severe. The regiment’s second in command, Lieutenant Colonel Alexander, was nearly killed, and the regiment’s two color-bearers, both from Company C, were also seriously wounded while preventing the American flag from falling into enemy hands. F Company lost men as well. Some were wounded or killed in action; still others were captured and marched off as prisoners of war (POWs) to Camp Ford, a Confederate prison camp in Tyler, Texas. Following what some historians have called a drubbing by the Confederate Army and others have called a technical Union victory (or at least a draw), the 47th Pennsylvania fell back to Grand Ecore, where the men resupplied and regrouped until 22 April. 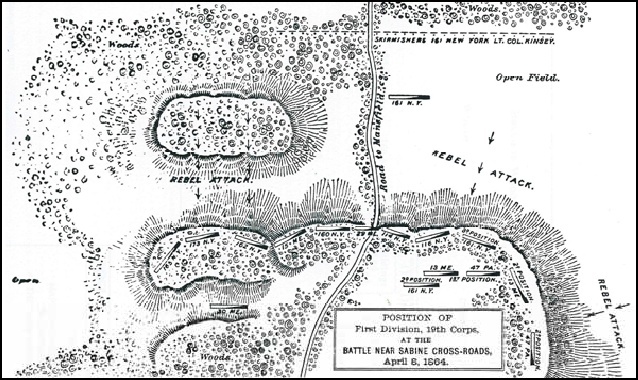 Retreating further to Alexandria, they then scored another victory against the Confederates, this time in the Battle of Cane River near Monett’s Ferry on 23 April. Christened “Bailey’s Dam” for the Union officer who ordered its construction, Lt. Col. Joseph Bailey, this timber dam built by the Union Army on the Red River, Alexandria, Louisiana, May 1864 facilitated passage of Union gunboats. Photo: Public domain. 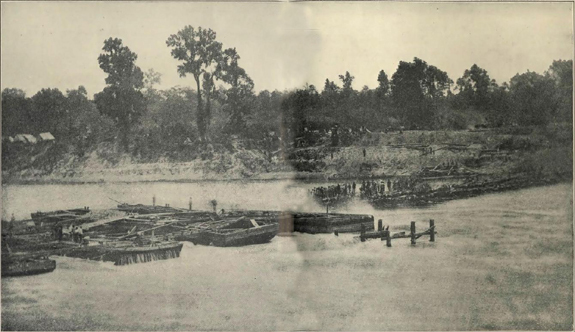 Placed under the command of Lieutenant-Colonel Joseph Bailey from April 30 through May 10, the 47th Pennsylvanians then helped to build a timber dam across the Red River near Alexandria, which enabled federal gunboats to more easily traverse the river’s fluctuating water levels. Beginning 16 May, Captain Henry S. Harte and F Company moved with most of the 47th from Simmsport across the Atchafalaya to Morganza, and then to New Orleans on 20 June. On 22 June 1864, Lieutenant George W. Fuller was discharged on a Surgeon’s Certificate while his brother, Private Orlando Fuller, continued to fight on with the 47th Pennsylvania, which had been ordered to return to the East Coast for further duty. Steaming for the Washington, D.C. area aboard the McClellan beginning 7 July 1864, Private Orlando Fuller and his fellow 47th Pennsylvanians from Companies A, C, D, E, F, H, and I had a memorable encounter with President Abraham Lincoln before joining with Major-General David Hunter’s forces at Snicker’s Gap, Virginia, where they fought in the Battle of Cool Spring and also assisted in defending Washington, D.C. while helping to drive Confederate troops from Maryland. Attached to the Middle Military Division, Army of the Shenandoah beginning in August, September saw the departure of several 47th Pennsylvania Volunteers who had served honorably, including the captains of Companies D, E and F and Private Orlando Fuller, the older brother of 1st Lieutenant George W. Fuller. All four mustered out at Berryville, Virginia on 18 September 1864 upon expiration of their respective three-year terms of service. Less than two weeks later, 1st Lieutenant George W. Fuller was dead. Although he had been discharged on a Surgeon’s Certificate in June, he had been too ill to travel and had been left behind to convalesce. 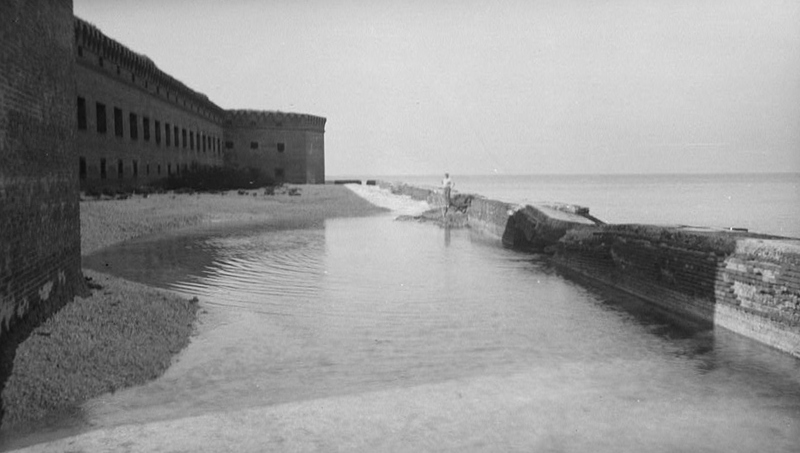 On 29 September 1864, he passed away at Fort Jefferson in the Dry Tortugas, Florida. His remains were prepared for transport home to the Lehigh Valley, likely by Paul Balliet. 1st Lieutenant George W. Fuller was laid to rest at the Fairview Cemetery. In recognition of his service to the nation, the Grand Army of the Republic chapter in Catasauqua was named the Lt. G. W. Fuller Post No. 378. Initially organized on 19 August 1867, the first officers of this G.A.R. post were all members of the 47th Pennsylvania Volunteers: Post Commander Edwin Gilbert (former captain of F Company), SVC Spencer Tetermer, JVC William H. Myers, and Adjutant Aaron McHose. Briefly disbanded in 1869, the post was reorganized on 13 April 1872, briefly disbanded in 1876, and reorganized again on 10 September 1883. 1ST LIEUTENANT AND REGIMENTAL ADJUTANT JAMES WHEELER FULLER, JR.
James Wheeler Fuller, Jr. was born in Catasauqua, Lehigh County, Pennsylvania on 16 March 1845, the second oldest son of James Wheeler Fuller, Sr. and nephew of James, Sr.’s older brothers, Orlando and George W. Fuller, who served with the 47th Pennsylvania Volunteers, respectively, as a 1st Lieutenant and Private. Descended from an English pioneer who sailed for the New World aboard the Mayflower in 1620, he became a pioneer in his own right as an internationally respected inventor and business executive. * Note: Although several sources indicate that the year of birth for J. W. Fuller, Jr. was 1843, an 1894 U.S. passport application (completed in James W. Fuller, Jr.’s own hand) indicated that his year of birth was 1845. In 1850, James W. Fuller, Jr. resided in Hanover Township, Lehigh County, Pennsylvania with his parents and brothers: Orange M. Fuller (1841-1902) and William F. Fuller (1845-1852). Also living at the Fuller family home at this time were several boarders and Abbott Fuller and Ellen Caroline Tombler (1831-1914). Born in 1828, Abbott Fuller was the brother of James W. Fuller, Sr. and uncle of James W. Fuller, Jr. A native of Catasauqua in Lehigh County and daughter of Daniel Tombler (1796-1841) and Catharine (Hartzell) Tombler (1797-1852), Ellen Caroline Tombler was employed in 1850 as a servant in the Fuller family home and would, in a few short years, go on to marry the man who would later become the Fullers superior during the Civil War – Captain Edwin Gilbert of Company F, 47th Pennsylvania Volunteers. A product of the local public schools, James W. Fuller, Jr. furthered his education by attending private schools in the Pennsylvania communities of Weaversville, Norristown and Kingston. James W. Fuller, Jr. enrolled for military service at Catasauqua in Lehigh County, Pennsylvania on 21 August 1861. He was awarded the rank of Sergeant with Company F of the 47th Pennsylvania Volunteers (the same company and regiment in which his uncles Orlando and George W. Fuller served), and mustered in at Camp Curtin in Harrisburg, Dauphin County on 30 August. Following a brief training period in light infantry tactics, he was shipped by rail with his uncles and their fellow 47th Pennsylvanians to Washington, D.C. where, beginning 21 September, they were stationed roughly two miles from the White House at “Camp Kalorama” near Georgetown. Mustered into federal service with the U.S. Army on 24 September, they became part of Brigadier-General Isaac Stevens’ 3rd Brigade. Ordered to march out once again, they headed for Camp Lyon, Maryland on the Potomac River’s eastern shore before moving on toward Camp Advance. They pitched their tents in a deep ravine near Fort Ethan Allen and Union General W. F. Smith’s headquarters. As part of the massive Army of the Potomac, they were assigned to help to defend the nation’s capital. ‘Owing to the forethought of his uncle, Lieut. George W. Fuller, a victim of the same war, two young girls, daughters of the owner, Mr. Wren, attended us through that long siege of sickness where he lay nigh to death many weeks. After a tedious convalescence, he recovered only in a measure and was honorably discharged, whilst I recovered to serve the full period of three years. ‘In 1891 he said to me, ‘I wonder what became of the Wren girls; let us go down and see.’ We went to Washington and drove up along the Potomac to the Chain Bridge; thence over into Fairfax County, Virginia, and as we came near the place we could not fix our surroundings, as large trees had grown where there had been farm land, and we stopped at a farm house, when a man over thirty-five years of age, a Mr. Catlin, came out, and we inquired if that house on the hill was the Wren house and whether the 47th Pennsylvania Regiment and 7th Maine Regiment had encamped on yonder slope the first Winter of the war. ‘Oh, yes,’ he replied. ‘I heard my father say that the regiments lay there and lost 200 men that first Winter. Anyhow, the Wrens live there.’ I shall never forget as he turned to me and said, ‘How strange; did you hear him say, ‘My father told me?’ We forget a generation had grown up since that time.’ As we entered the house, the first object that attracted his attention was Lieut. George W. Fuller’s photograph in full uniform on the mantel. However, that article was derived almost entirely from the Lambert-Reinhard book and the dates presented both in the book and in the retelling of that account by The Allentown Leader were wrong (1863-1864 instead of 1861-1862 when the 47th was stationed in Virginia). Furthermore, members of the 47th Pennsylvania generally were not treated for their illnesses in the homes of civilians, but in camp. When deemed seriously ill, they were confined to the post hospital associated with their respective duty stations. 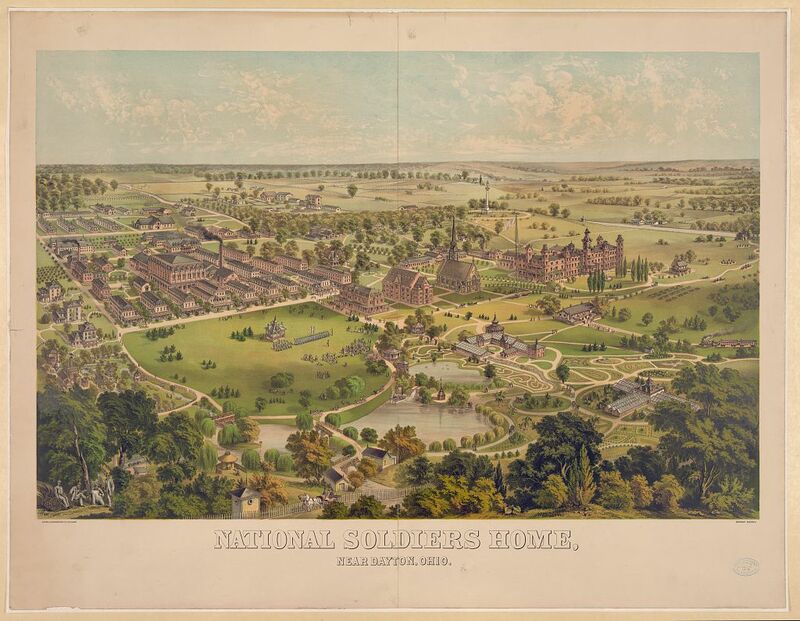 When wounds or illnesses were deemed beyond the capacity of these facilities, soldiers were moved on to the Union Army’s larger general hospital system where they could receive more advanced care. In addition, several of the biographical sketches in the Lambert-Reinhard book also contain other factual errors. (The sketch for James W. Fuller, among its mistakes, lists the company he initially served with in the 47th Pennsylvania Volunteers as Company I, rather than Company F.) Even more puzzling, while the Lambert-Reinhard book and Fuller’s military records indicate that J. W. Fuller, Jr. was 18 at the time of his enlistment (making his birth year 1843, a fact which seems to be confirmed by his gravestone), Fuller’s own passport application – completed in his own hand – stated that he was born in 1845 (meaning he was just 16 at the time of his enlistment). The timing and subsequent short duration of his promotion, combined with the confusion surrounding his birth year, may signal that James W. Fuller, Jr. was actually under age at the time of his enlistment and may have been removed from harm’s way by his superiors once they discovered he was not the 18-year-old he had claimed to be at enlistment, or at the request of his father, James W. Fuller, Sr., who was a close friend of Pennsylvania’s Governor. Regardless of the cause of his honorable discharge, James W. Fuller, Jr. most definitely did serve with the 47th Pennsylvania Volunteer Infantry during the early days of the Civil War. On October 11, his regiment marched in the Grand Review at Bailey’s Cross Roads after having been ordered with the 3rd Brigade to Camp Griffin. In mid-October, he may have served on picket duty in fulfillment of an order which directed Companies D, A, C, F and I (the 47th Pennsylvania’s right wing) to take over after the left wing companies (B, G, K, E, and H) were forced to return to camp by Confederate troops. On 22 October 1861, his regiment took part in a spectacular Divisional Review, described by historian Lewis Schmidt as massing “about 10,000 infantry, 1000 cavalry, and twenty pieces of artillery all in one big open field.” And on 21 November, his regiment engaged in another morning divisional headquarters review – this one under the watchful eyes of Colonel Tilghman H. Good, the 47th’s commanding officer. 1st Lieutenant James W. Fuller, Jr. also likely participated in the regiment’s move from its Virginia camp back to Maryland, where it was quartered in barracks at Annapolis. During a long, active and useful career, James W. Fuller, second, was prouder of nothing more than of his association with the 47th Regiment, of whose Veteran Association he was president when he died [in 1910]. Sometime around mid-March 1866, James W. Fuller, Jr. entered into a partnership agreement with his uncle Charles D. Fuller, friend James Harper McKee (1818-1895), brother-in-law James Thomas, and William R. Thomas (1829-1917) to create McKee, Fuller and Company in order to manufacture railroad car wheels. Together, they purchased roughly eight miles of land along the Lehigh Valley Railroad’s main line, got their factory up and running, and were able to achieve a production rate of 15 wheels per day. On 2 April 1873, James W. Fuller, Jr. and his wife, Kate, welcomed son James W. Fuller, III (1873-1929) to their Catasauqua home. The colonel was president of the Allentown Portland Cement Company, Valley Forge Cement Company, of Conshohocken, and the Fuller Company which constructed and shipped pulverizing machinery to all parts of the world. He was reputed to be a multi-millionaire. The title of ‘colonel’ was bestowed on Mr. Fuller through his appointment to the Pennsylvania Guard Staff by former Governor Tener. He was a prominent member of the Mayflower society. His ancestor [sic] being the Dr. Fuller who served as physician to the pilgrims on the Mayflower’s historic voyage to America. Thoroughbred Arabian and Persian horses and prize winning Jersey cattle were hobbies of Colonel Fuller. He kept many prize winners on his Willow Brook farm near Catasauqua. Despite the joy experienced when his son James, III was born, life was not all roses and sunshine for James W. Fuller, Jr. Business operations became increasingly difficult due to the Panic of 1873, which hampered profit generation efforts by Fuller and his partners, who dropped out as the stagnation turned into an economic depression across North America and in Europe. Before a decade had passed, Fuller and McKee were the only partners left. Reinvesting whatever profits they could eke out, they added machinery and expanded their land holdings until their fortunes finally changed. McKee, Fuller added production capacity by purchasing Frederick and Beck, an idle car plant, and then expanded its workforce to 1,500, relaunched the closed Davies Foundry, and added a forge. In 1876, the firm garnered even greater recognition when its exhibit at the Chicago World’s Fair was given one of that fair’s top awards. In 1880, they secured a contract with the Erie Railroad to modernize the railroad’s fleet with eight-wheeled cars. Fuller also became active in the development of Ferndale during the 1870s, working to turn it into a vibrant company town for his workers. On 13 February 1883, William Weir McKee (1852-1905), the son of Fuller’s business partner James H. McKee, and B. Frank Swartz joined the partnership. By June, the firm had made $2,800,000 by producing 1,849 eight-wheeled railroad cars. By 1884, they were making $4 million annually. In 1895, the town of Ferndale in Whitehall Township, Lehigh County was renamed “Fullerton” to honor the contributions made to its growth and prosperity by James W. Fuller, Jr. Sadly, that same year, Fuller’s business partner James H. McKee died. Six years later, in 1901, a new partnership charter was established, interests were redistributed, and the firm was renamed, officially becoming the Lehigh Car, Wheel & Axle Works. As railroads phased out their wooden cars and a new century dawned with new needs, Fuller and his business partners entered into the Lehigh Valley’s burgeoning cement industry, and became internationally respected for their high quality machinery supplied to local and foreign mills. Adding to his success, Fuller also served as president of the Catasauqua Manufacturing Company, vice president of the Empire Steel and Iron Company (formerly the Lehigh Crane Iron Company) and on various corporate boards of directors, including those of the Catasauqua & Fogelsville Railway Company, the Ironton Railroad, two coal companies, the Lehigh Foundry Company, the Lehigh Valley Trust Company of Allentown, the Thomas Iron Company of Hokendauqua (formerly the Lehigh Crane Iron Company), and the Wahnetah Silk Company of Catasauqua. James W. Fuller, Jr., died at his home in Catasauqua, Lehigh County, Pennsylvania on 15 January 1910. As with his father before him, he was interred at the Fairview Cemetery in West Catasauqua. Mr. Fuller inherited from his father personal magnetism and an alert mind, grasping a subject quickly, almost intuitively, had an excellent knowledge of men and had that peculiar ability in a great degree possessed by men of large affairs in selecting men for positions of responsibility and trust and attach them to him by strands of steel. From his mother he inherited a wiry constitution, free from taint, love of rural scenes, of animals and a rapid manner or speech. In all my life I never heard from his lips an unclean or unchaste word; never an oath, and under great provocation as a rule kept himself master of the situation. An aged mother had but to express a wish and it was granted, whilst he stood sponsor for his sister and brothers, always ready to grant any reasonable desire. Fortunate indeed were the son and daughters who had the benefit of his advice and guidance, and it would be impossible in this short sketch even to enter the door in describing the good deeds done by him, and fortunate is the town or community that can number a citizen like Mr. Fuller, whose life work lies within its boundaries. Born in Luzerne County, Pennsylvania in March 1826, Orlando Fuller was a son of Sarah (Abbott) Fuller and Chauncey D. Fuller, the older brother of 1st Lieutenant George W. Fuller of F Company, 47th Pennsylvania Volunteers, and James W. Fuller, Sr., and the uncle of 1st Lieutenant and Regimental Adjutant James W. Fuller, Jr. who also served with 47th Pennsylvania Volunteers. Orlando and his brother, James (later James Sr.), spent their early years in the “Plains” of North Wilkes-Barre in Luzerne County before relocating with their parents and siblings to the Lehigh Valley sometime after construction began on the Lehigh Canal. On 25 August 1861, Orlando Fuller enrolled for military service at Catasauqua, Pennsylvania. He then mustered in for duty at Camp Curtin in Harrisburg on 30 August 1861 as a Private with Company F, 47th Regiment, Pennsylvania Volunteer Infantry. His tour of duty took him to all of the same locations and service assignments as those experienced by 1st Lieutenant George W. Fuller (his younger brother and one of his superior officers in Company F), plus a few more. From Camp Curtin, the Fuller brothers were stationed together at Camp Kalorama in Washington, D.C. (Fall 1861), garrisoned Fort Taylor in Key West, Florida and served in the U.S. Department of the South’s Beaufort District in South Carolina (1862), participated in the capture of Saint John’s Bluff, Florida (1-3 October 1862) and the Battle of Pocotaligo, South Carolina (21-23 October 1862), garrisoned Fort Jefferson in the Dry Tortugas, Florida (1863), and fought in Union General Nathaniel Banks’ Red River Campaign across Louisiana (as part of the only Pennsylvania regiment so engaged from March to May 1864). Then, after his brother was discharged on a Surgeon’s Certificate on 22 June 1864, Private Orlando Fuller continued to fight on, serving with the 47th Pennsylvania at Snicker’s Gap under the command of General David Hunter (mid-July 1864) and then with the 47th under legendary General Philip H. Sheridan during the opening days of his tide-turning 1864 Shenandoah Valley Campaign. On 18 September1864, Private Orlando Fuller mustered out from the 47th Pennsylvania Volunteers at Berryville, Virginia upon expiration of his three-year term of service. He was also suffering from heart disease and aortic stenosis at this time. Less than two weeks later, his brother George was dead, having passed away at Fort Jefferson in the Dry Tortugas, Florida on 29 September. Despite his heart condition, Private Orlando Fuller opted to continue to serve his nation, re-enrolling and re-mustering in on 24 February 1865 at Reading in Berks County, Pennsylvania as a Private with Company D of the 28th Pennsylvania Volunteers, a regiment attached to the Union Army’s 1st Brigade, 2nd Division, 20th Army Corps, Army of the Cumberland until June 1865, and then to the 3rd Brigade, Bartlett’s Division, 22nd Army Corps, U.S. Department of Washington. Among its late stage engagements, the 28th Pennsylvania engaged in the Campaign of the Carolinas (until April 1865), the Union Army’s march to Richmond, Virginia and Washington, D.C. (29 April-20 May 1865), and the Grand Review of the Armies in Washington, D.C. (23-24 May 1865). Following the assassination of President Abraham Lincoln, the 28th Pennsylvania also served with the U.S. Department of Washington during the early days of the imprisonment and trial of the Lincoln assassination conspirators (May 1865). Sometime during this phase of service, Private Orlando Fuller developed rheumatic heart disease; he was subsequently mustered out with his regiment at Alexandria, Virginia on 18 July 1865. Following his second honorable discharge from the military, Orlando Fuller returned home to the Lehigh Valley for what he likely thought would be the remainder of his life. By 1870, still unmarried, he was employed as a laborer and living with the family of John Gohring, a retired grocer who resided in South Bethlehem, Northampton County, Pennsylvania. Mr. Orlando Fuller, an employee at the Car Wheel Works of McKee & Fuller, at Ferndale, had his left foot badly hurt one day last week by being struck thereon by a falling car wheel. By 1895, Orlando Fuller was a resident of Wescosville, according to November 1895 editions of The Allentown Leader and The Allentown Democrat, which also announced that he had recently been awarded his original pension for service during the Civil War. The amount initially granted – $6.00 monthly – steadily increased over the years until reaching a rate of $12.00 per month, and was awarded due to his “Inability to earn a support by Manual labor,” according to an entry in the admissions ledger for the Central Branch of the U.S. National Home for Disabled Volunteer Soldiers at Dayton, Montgomery County, Ohio (where he was admitted on 7 November 1895). This 1895 ledger entry also described him as an unmarried Protestant, former laborer, aged 69, who was 5’9” tall with a dark complexion, gray hair and gray eyes, who was able to read and write. Although his residence subsequent to discharge in the Dayton Soldiers’ Home admissions ledger was shown as Wescosville, it is clear from U.S. Census records of the time, that Orlando Fuller had opted to resettle in Montgomery County to be closer to the federal government’s medical care he was able to receive as a former Civil War soldier. Like many of the 47th Pennsylvania Volunteers, Orlando Fuller suffered not only from the heart disease which prompted his discharge from the 47th Pennsylvania in September 1864 and from the 28th Pennsylvania in 1865, but from chronic bronchitis, first contracted due to the often damp and harsh conditions experienced during the early years of the Rebellion. FULLER – At the Central branch, National Military Home for D.V.S., December 22, 1904, Orlando Fuller, late of Co. D, 28th Pennsylvania Infantry aged 78. Cause of death, chronic bronchitis, with senectus [old age]. His net worth was appraised by the Dayton National Soldiers’ Home as $341.40, $335 of which was yet to be drawn from his pension, the remaining $6.40 being “found on person.” The next of kin listed on the Dayton Soldiers’ Home admissions ledger was his nephew and former employer, James W. Fuller, Jr. of Catasauqua, Pennsylvania. A death entry in that same soldiers’ home admissions ledger indicated that Private Orlando Fuller was interred at the Dayton National Cemetery in Dayton, Montgomery County, Ohio in Section N, Row 12, Grave 17. 1. Allentown’s First Undertaker Dead, in Town and Country Newspaper. Pennsburg, Pennsylvania: 16 January 1904. 2. Bates, Samuel P. History of Pennsylvania Volunteers, 1861-5, Vol. I. Harrisburg, Pennsylvania: B. Singerly, State Printer, 1869. 3. Big Achievements of the House of Fuller: Long Line of Able Men Whose Ancestor Was a Signer of the “Mayflower” Agreement Noted for Their Accomplishments. Allentown, Pennsylvania: The Allentown Leader, 27 June 1914. 4. Civil War Muster Rolls, in Records of the Department of Military and Veterans’ Affairs (Record Group 19, Series 19.11, 28th Regiment, Pennsylvania Volunteer Infantry and 47th Regiment, Pennsylvania Volunteer Infantry). Harrisburg, Pennsylvania: Pennsylvania Historical and Museum Commission. 5. Civil War Veterans’ Card File. Harrisburg, Pennsylvania: Pennsylvania State Archives. 6. Col. James Fuller Dies of Sleeping Sickness, in The Daily Notes. Canonsburg, Pennsylvania: 4 April 1929. 7. Col. J. W. Fuller Dies in ‘Frisco: Wealthy Cement Magnate Reported to Have Died from Sleeping Sickness Resulting from Bite of Bug. Shamokin, Pennsylvania: Shamokin Dispatch, 4 April 1929. 8. Death Notice (Orlando Fuller). Dayton, Ohio: Dayton Daily Journal, 29 December 1904. 9. Death of Paul Balliet: Allentown’s Oldest Undertaker Passes Away at His Home on Union Street. Allentown, Pennsylvania: The Allentown Leader, 13 January 1904. 10. Fuller Family Baptismal, Marriage and Death Records, in Historic Pennsylvania Church and Town Records. Philadelphia, Pennsylvania: Historical Society of Pennsylvania. 11. Fuller Family Baptismal, Marriage and Death Records, in Methodist Church Records. Valley Forge, Pennsylvania: Eastern Pennsylvania United Methodist Church Commission on Archives and History. 12. Lambert, James Franklin and Henry J. Reinhard. A History of Catasauqua in Lehigh County, Pennsylvania. Catasauqua, Pennsylvania: Searles & Dresser Company, Incorporated, 1914. 13. Local and Personal (Mr. Orlando Fuller). Lehighton, Pennsylvania: The Carbon Advocate, 22 April 1876. 14. New Lehigh Colonel on Governor’s Staff: James W. Fuller Accepts Tender of Place by Mr. Tener: Family Strongly Patriotic: Father Adjutant of 47th Penna. Volunteers and Grandfather Close Friend of Curtin – Also Noted for High-Class Business Ability. Allentown, Pennsylvania: The Allentown Leader, 23 January 1911. 15. Orlando Fuller, in Records of the Department of Veterans Affairs (Record Group 15, Microfilm M1749), in Historical Register of National Homes for Disabled Volunteer Soldiers. Washington, D.C.: U.S. National Archives and Records Administration, 1895-1904. 16. Returned. Allentown, Pennsylvania: The Allentown Democrat, 3 February 1864. 17. Schmidt, Lewis. A Civil War History of the 47th Regiment of Pennsylvania Veteran Volunteers. Allentown, Pennsylvania: Self-published, 1986. 18. U.S. Census: Washington, D.C., Ohio and Pennsylvania: 1860, 1870, 1880, 1890, 1900, 1910. U.S. Veterans’ Schedule: Washington, D.C. and Pennsylvania: 1890. 19. U.S. Civil War Pension Index. Washington, D.C.: Various Dates and Filing Locations: Fuller, Orlando (application no. : 1026012, certificate no. : 896744, filed from Pennsylvania by the veteran and his attorney). 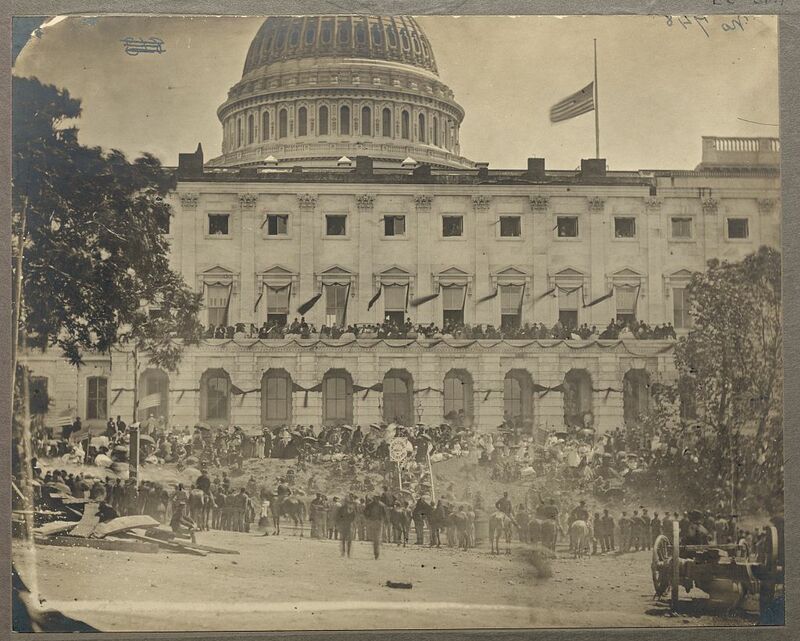 Washington, D.C. and Pennsylvania: 25 May 1891. 20. Passport Applications (Roll #: 415; Volume #: Roll 415). Washington, D.C.: U.S. National Archives and Records Administration, February 1894. 21. Wheeler, Albert Gallatins. Genealogical and Encyclopedic History of the Wheeler Family in America. Boston, Massachusetts: 1914. 22. Wint, David Charles. A History of the Iron Industry and Allied Businesses of the Iron Borough of Catasauqua Pennsylvania. Catasauqua, Pennsylvania: 1993.